June is quickly evaporating and the vegetable garden I planted the first weekend of June is showing signs of growth. The weather has been abnormally humid with plenty of rainfall and high's reaching to the mid 70's on the best of days. Rainbow Swiss Chard is coming in thick. I think I might have near 100% germination rate! I've heard is a very pretty, leafy green, at maturity. My luck with growing peppers in the past has been quite dismal. Imagine my surprise when my little banana peppers showed not just one, but multiple peppers per plant. Hmm, I've book marked my salsa recipes to can. 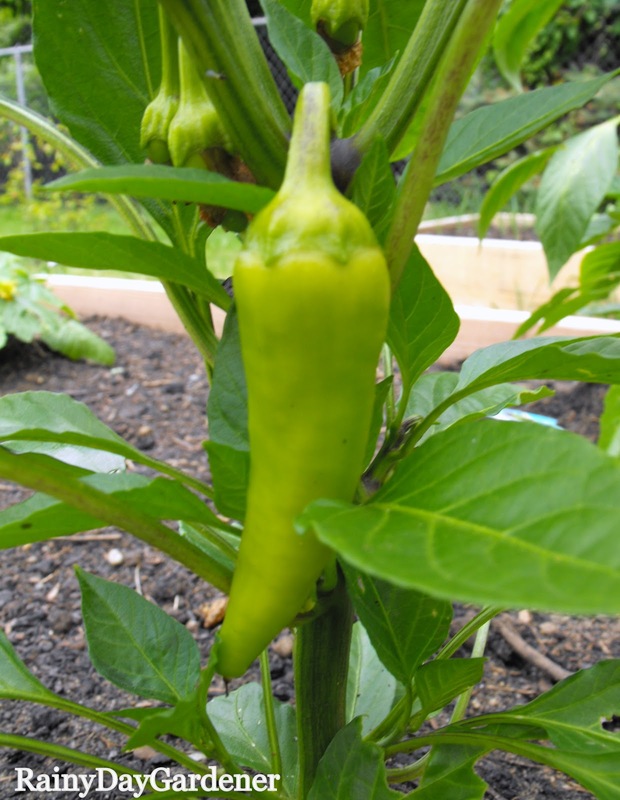 If I actually get a yield of this type of pepper, I may throw in the towel on growing bell peppers. The raspberries are in full swing. The rows heavy with red, globs of juicy sweetness. I've already picked through the four rows once and will need to pick again early this week. Summer spinach is growing strong. These were sown the first weekend of June. I'm so ready for fresh spinach salads. This is the New Zealand variety. Baby beef steak tomatoes and baby early girl tomatoes. I'm ready for fresh tomato sauce as the sauce frozen from last years harvest has been devoured. The squash, zucchini and pumpkins are also growing leaps and bounds. I've been feeding my blossoming vegetables homemade organic fertilizer and it's been providing impressive results. You can find the recipe here. 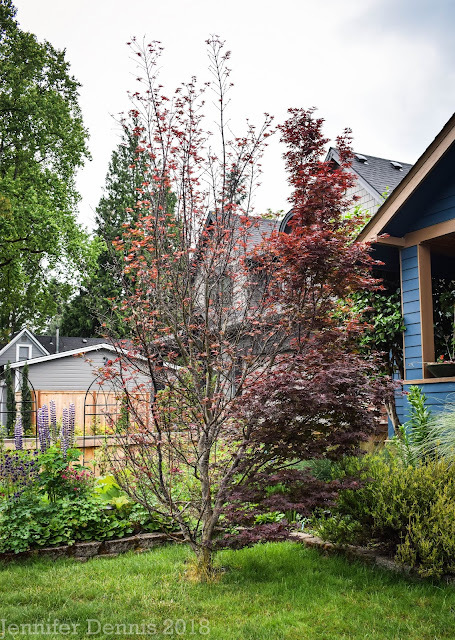 While I haven't been able to hover over my vegetable garden much this growing season due to living in one house and moving to the house with the garden in late July, it has been a quite rewarding to arrive at the gardens and see them in such a good, healthy, growing state. Keeping my fingers x'd that continues. Wow Jenni you've got quite the impressive garden growing there! I appreciate your positive spin on our weather, I don't think I could be so generous. Not only an impressive array of veg, but also some stunning photos! Very nicely presented. So the damp conditions are good for some things, eh? Your veg looks picture perfect, and not a nibble in sight. It must be so rewarding to see such great growth on your plants. Those beef steak tomatoes are going to be fab! Hi Kelli, no nibbles yet, but my herb garden at the existing house is quite nibbled by slugs. drat. I'm amazed that my summer gardens have not had any issue of yet. Finger's x'd! 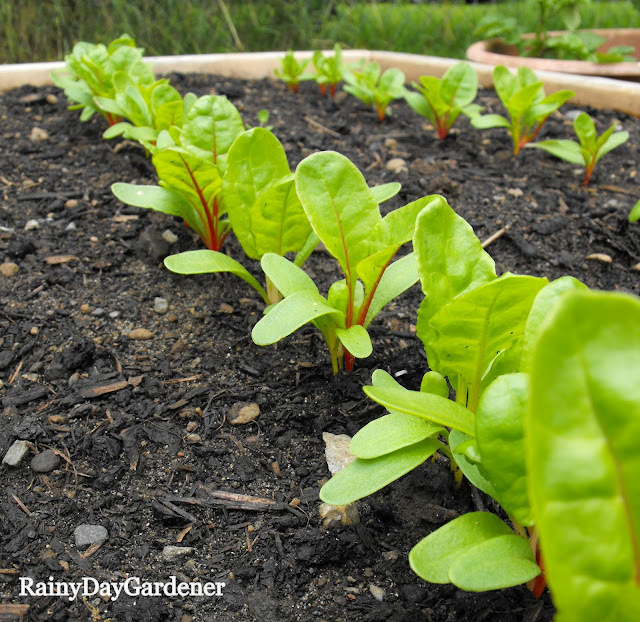 I love that first photo, down low for a row-shot of the chard. Very nice. 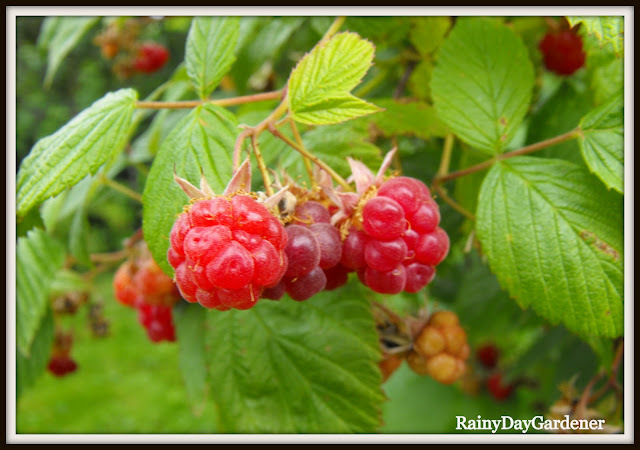 We've been eating gobs of raspberries too. This is quite the year for them. I think the rain has made the difference. Congrats on the tomatoes. Yours are light years ahead of mine. Hi Grace, I feel like I cheated on the tomatoes. I bought the organically grown plants at Fred's and they were already super huge. The ones I started from seed are now, maybe 5" tall on a really good day. Your garden looks great, Jenni! I am so jealous of your tomatoes. I bought starts too, and I don't have any little green babies yet, lots of flowers though. So, these are at the new house that you've been working so hard on? Yes, it is! I'm very hopeful to have a large, tomato harvest this year!! 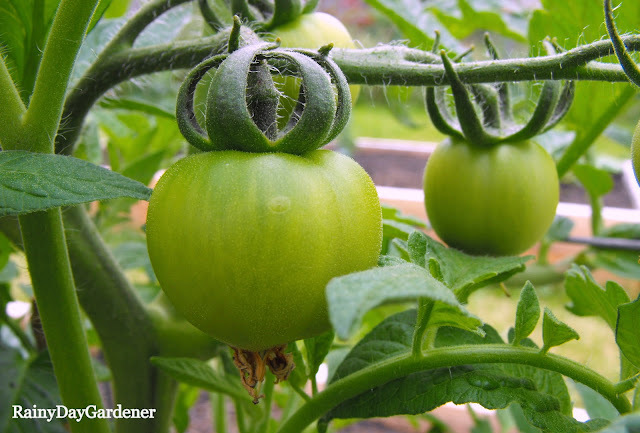 Those little green tomatoes honestly appeared just this week. I applied some of my comfrey fertilizer and bam..I got those. So awesome! I wish our plants were as far on - latest was a battering by the winds. We need some consistent warm weather as it seems warm one day and cold the next - not good for plants. Hi Sue, you have really been battered with poor weather! I've read that from Mark and Kelli also. Surely there will be a change soon! Your veggies look divine! I grow less and less as the wildlife nearby has decided it must be for them. I try to coexist but each year I think of fencing in the raised beds. Everything looks so healthy, and happy. And then I go and look at mine...sigh, other then my peas that is. They love all this rain, it's everything else that is sad. Maybe I have to try this comfrey fertilizer, thinking about it. 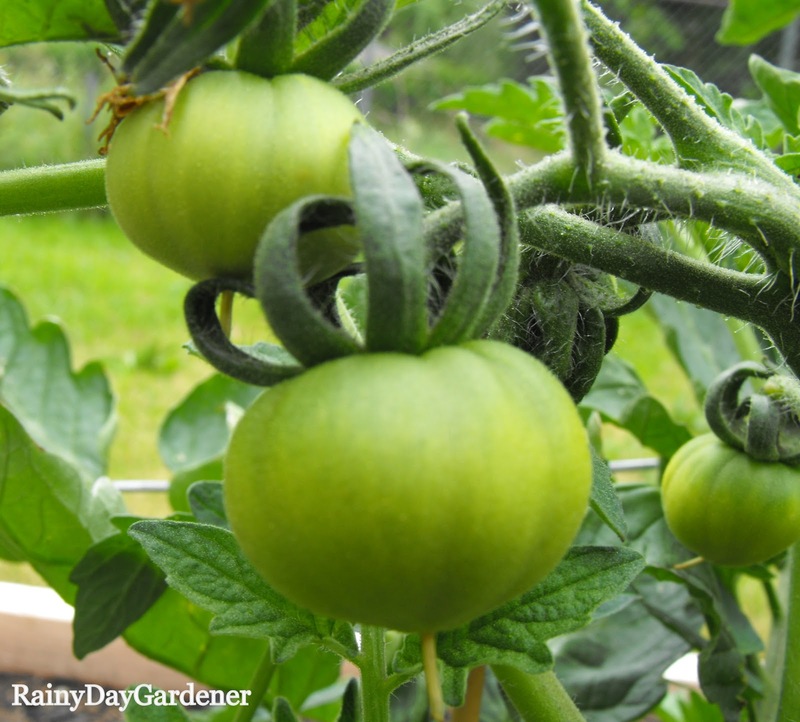 Jen, using the homemade comfrey fertilizer has seriously made all the difference for my tomatoes! 100 percent germination rate is something to be happy about. And your garden really turn out well, healthy and fresh! Everything looks so good. I'm excited about your peppers. My tomatoes are just setting. I can't wait to see your salsa. Jenny, everything is looking good! Raspberries are red already? Mine are tiny and colorless yet! I have tomatoes only on one plant so far. I gave up on growing peppers long ago. 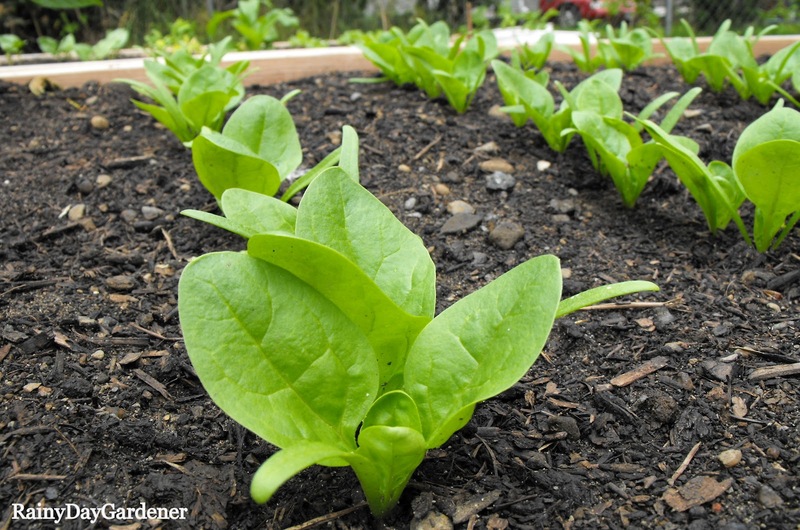 Lettuce is doing better than all the other vegetables. My garden needs some sun! Your garden looks terrific. We have had so much cool weather and rain in Maine that I don't know what kind of a crop of tomatoes I will get this year. Continued good luck. Your veggies are so nice and organized! Mine are a big mish mash. Maybe that's why yours seem so much happier. Really besides spinach not much is growing at all here. I can't believe you have peppers already! My plants are turning yellow, I think they are just drenched.